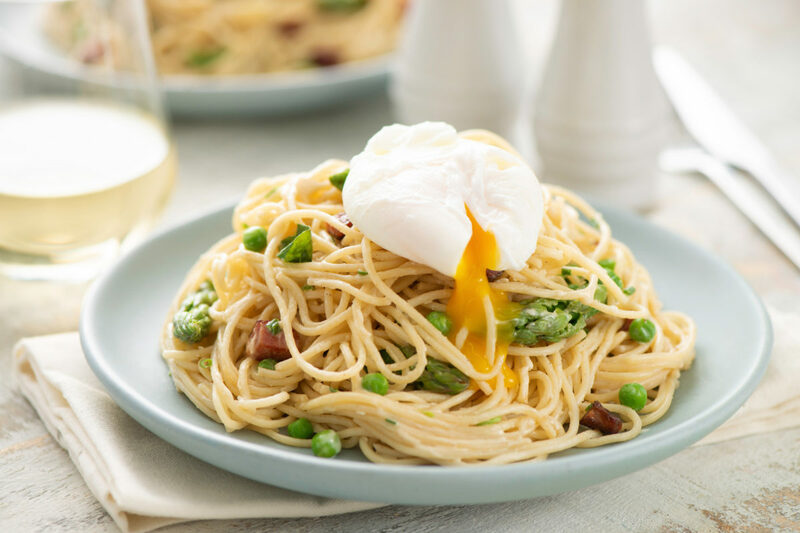 This take on a classic Italian pasta dish is topped with a lovely poached egg, then paired with fresh spring vegetables in a creamy roasted garlic sauce that is out-of-this-world delicious. Cook spaghetti according to package directions, adding 1 tbsp garlic base to cooking water; drain well, reserving 1/2 cup cooking water. Meanwhile, in large skillet set over medium-high heat, cook pancetta for 7 to 8 minutes or until crisp. Transfer to paper towel–lined plate. Stir cream, reserved cooking water, asparagus, peas and remaining garlic base into skillet; bring to boil. Cook for 3 to 5 minutes or until thickened slightly. Reduce heat to medium-low. Add pasta to skillet; cook for 1 to 2 minutes or until well coated. Add pancetta, Pecorino, basil, chives and pepper to skillet. Divide among plates; top each serving with poached egg. Tip: To poach eggs, pour enough water into saucepan to come 3 inches up side; heat over medium heat until water simmers gently. Stir in 1 tbsp vinegar. Break each egg into small dish. Holding dish just above simmering water, slip each egg into water. Reduce heat to medium-low. Cook, in barely simmering water, for 3 to 5 minutes or until the white is set and yolk is cooked to desired level of doneness. Remove eggs with slotted spoon and drain on paper towel.